A portrait of Hürrem Sultan currently on display at Topkapı Palace Museum. It is not known where Hürrem Sultan, often identified as Roxelana, Rossalane, Roxa, Roza, Rossa or Ruziac by Western historians, was exactly from. Galina Yermolenko, a historian and researcher said, "Roxolana's birth in the Ottoman Imperial Harem can be likened to the shining of a meteor or a bright comet in the dark of night." Some European researchers and historians have claimed that Hürrem Sultan was of Russian origin. 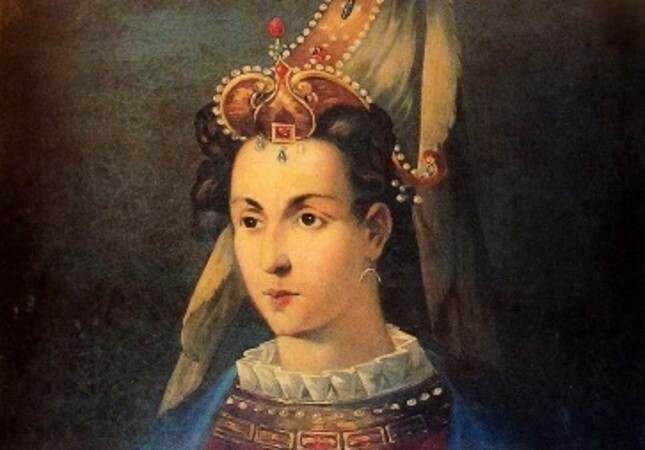 Mikhail Litvin, a Lithuanian ambassador to Crimea in the mid-16th century, said, "Hürrem, the love of the Turkish emperor and the mother of the oldest prince and the heir, was kidnapped from our land a while ago." For Venetian Ambassador Navagero, Hürrem Sultan was from the Russian nation; she was so loved by the Sultan that no other woman held as much power as her. She was nice, humble and knew the sultan's nature well. Another Venetian ambassador, Trevisano, also claims Hürrem to be of Russian origin. Researcher Yermolenko added that "the belief that Roxolana is more Russian than Ukrainian comes from the misinterpretation of the words of Roxolana and Rossa. Europe in the early modern period referred to Western Ukraine as the state of Ruthenia. This name was mentioned as Red Russia Galicia or Podolia (Eastern Podolia is in present-day Poland) at different times. Present-day Russia was called Moscow or Moscovy Russia or Duchy of Moscow. In ancient times, Roxolani was used for a nomadic Sarmatian tribe and settlements near the Dniester River." It is also said that the Europeans name for Hürrem Sultan, Roxelana was the derivative of a Polish term that meant "Ruthenian Virgin." For Samuel Twardowski, the Polish ambassador to Istanbul in the 1620s, Roxolana was the daughter of an Orthodox priest from Rohatyn, a town close to Lvov on the Dniester. In line with an ancient folk song of the Bukovina region, young and beautiful Nastusenka was kidnapped by Tatars from Rohatyn and sold to the sultan's harem. Hürrem Sultan was taken prisoner by Tatars from where she lived near Lvov on the Dniester. It is not known through exactly which way she was brought to the Harem. It is also not certain whether she entered the Harem of Süleyman I, known as Süleyman the Magnificent, in Manisa or Istanbul. It is estimated though that she was around 14 and 17 at the time. She was named as Hürrem since she always had a smiling face. When the time came, she was able to come forward and win the heart of Süleyman I.
Shahzade Mehmed was born in 1521, and Süleyman, thereafter, thought the sun rises and sets on Hürrem, who then never let any other woman come near the sultan. As Hürrem enchained Süleyman to herself, she was at odds with other women in Harem, especially with Mahidevran, the mother of Shahzade Mustafa. However, before the situation went even further, Hafsa Sultan, Süleyman's mother, intervened and the tension ended shortly. When Hafsa Sultan passed away in 1534, the only ruler of the Harem was Hürrem Sultan. And her first move was to send Mahidevran to his son, Shahzade Mustafa. Then, Süleyman married Hürrem in 1533 or 1534, when sultans could not marry odalisques. Until her death in 1558, she was Süleyman's greatest love and companion. 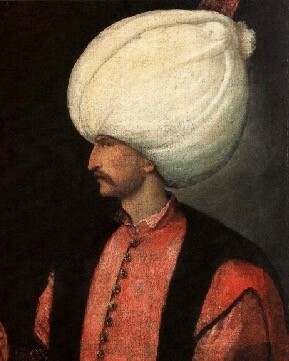 Hürrem Sultan, unlike the previous haseki sultans (chief consorts), did not go to the sanjak with his eldest son Mehmed, who was sent to the sanjak of Manisa in 1542. She did not also leave Istanbul when his two sons were sent to sanjaks as governors. Not to leave his disabled son Shahzade Cihangir alone in Istanbul, not to prefer one of his sons and not to leave Süleyman alone affected this decision. However, she frequently visited the places where his sons performed their duties as governors and did not leave them alone. In 1543, she visited Shahzade Mehmed in Manisa and Shahzade Selim in Konya. In 1544, she went to Bursa together with her daughter Mihrimah and her son in law Rüstem Pasha. She gathered her family there. She spent a month with Shahzade Selim, who was sent to Manisa after Shahzade Mehmed's death in 1547. She also took Shahzade Cihangir along. In 1548, during the campaign of Azerbaijan, she visited Shahzade Selim, who was commissioned to Edirne to safeguard the western borders and the region. According to the reports of Venetian ambassadors Navagero and Trevisano in 1553 and 1554, Hürrem Sultan, who was about 50 years old at that time, was still much loved by Süleyman the Magnificent. In those times, they were the shadow of themselves. According to these ambassadors, Hürrem Sultan was the greatest love of Süleyman's life, his companion, his official wife and an extraordinary female character. Hürrem Sultan opened the way to the throne for her sons, by phasing Shahzade Mustafa out of this competition. When she went to Edirne in 1558 with Süleyman, she became ill and all efforts of doctors failed. Mekkî, who was in Istanbul at that time, says that Hürrem Sultan suffered from malaria and shoulder pain for a while. Shortly after she was brought to Istanbul, she passed away in April 1558. Her funeral was held at the Bayezid Mosque and she was buried next to the Süleymaniye Mosque after a funeral prayer directed by Shaykh al-Islam Ebussud Efendi. In 1536, Hürrem Sultan had a mosque, soup-kitchen, madrasah, Ottoman social complex comprising of fountain, elementary-primary school and hospital built in Istanbul's Aksaray. This work was the first complex that Mimar Sinan built as the chief architect in Istanbul. Hürrem Sultan also built complexes in Edirne and Ankara. She had water brought to Edirne. She also built a soup kitchen and a hospital in Jerusalem and another soup kitchen in Mecca. She also had two baths with a soup kitchen built in Istanbul.